(Last Updated : 17.12.18). Download HSSC TGT, PGT Result & Cut-off Marks 2018. The Commission has declared Scrutiny Result of TGT Physical Education (Haryana Cadre). Earlier, the Commission released scrutiny/interview notice for various posts of PGT & TGT against Advt. No. 3/2015, 4/2015, 5/2015, 9/2015 & 4/2016 in Compliance of Honorable Punjab & Haryana High Court orders passed in CWP No. 2129 of 2017. The commission will call all those candidates who were earlier absent or declared ineligible for scrutiny of documents. Check latest updates on Scrutiny Schedule, Screening Result, Interview Dates, Final Result and selection marks list of PGT Hindi, PGT Economics, PGT Psychology, PGT Sociology, PGT English, TGT English, PGT Music, PGT Biology, PGT History & PGT Home Science (rest of Haryana), PGT Chemistry (MWT), PGT Geography (MWT), PGT Physics (MWT) & PGT Punjabi for rest of Haryana for Advt. No. 4/2015 & 5/2015. HSSC TGT Result 2018 are available here as and when the result is available on the official website of HSSC i.e. www.hssc.gov.in. TGT Cut-off Marks and Interview Letter are also available with TGT Screening Result 2018. HSSC screening result of PGT English & Hindi and other subjects for the interview has been declared by HSSC. Interview Letter for PGT qualified candidates can be downloaded as per the schedule from the official website of HSSC i.e. www.hssc.gov.in. Exam result and interview letter have been issued after the submission of HTET Details of newly passed candidates for the post of PGT. Check here Result and Cut-off Marks 2018 of HSSC TGT PGT Screening Test 2016. Haryana SSC declared screening test result 2018 with cut-off marks and interview schedule for the post of TGT & PGT for various subjects. Here you can download latest result, cut-off marks, scrutiny of documents of TGT PGT Screening exam 2016. Download HSSC Notice for PGT & TGT in Compliance of CWP No. 2129 of 2017 (13.11.17). Check here latest schedule of scrutiny of documents and interview for the post of PGT and TGT. 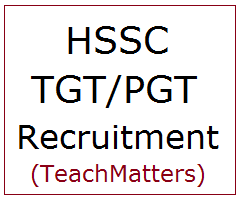 Interview schedule has been released soon for the post of TGT & PGT by HSSC. Candidates qualified for Viva-voce / Interview will be issued Interview Letter by the commission and qualified candidates can download Interview Letter / Hall Ticket to appear in the viva-voce as per the Interview Schedule 2018. HSSC released written exam schedule for the remaining posts of PGT for May 2016. HSSC TGT English & TGT Science Written Exam was held on 07.02.2016. Written exam for the post of TGT Science (Mewat Cadre), TGT Urdu, TGT Home Science (Haryana & Mewat Cadre), TGT Physical Education (Mewat Cadre) & TGT Music (Haryana Cadre) was held on 14.02.2016. HSSC has already conducted TGT English (Mewat cadre), TGT Physical Education, PGT Biology & PGT Music written exam in 2015. HSSC conducted screening exam for the post of PGTs from 3rd March 2016 to 27th March 2016. HSSC conducted PGT Physics & Chemistry written exam 2016 as per the schedule. Here you can download latest exam schedule and admit card. Download Admit Card for HSSC TGT, PGT Exam 2016. The candidates who have applied for the post of PGT and TGT can download their admit card for the post they applied for as per the schedule. HSSC TGT PGT Admit Card 2016 can be downloaded from 23.02.2016 at the official website of HSSC i.e. www.hssc.gov.in. HSSC Admit Card for TGT (Urdu, Science, Home Science, Music & Physical Education) exam 14.02.2016 were available from 09.02.2016. HSSC PGT Admit Card for PGT Physics & Chemistry Screening Exam 2016 can be downloaded as per the schedule. HSSC on 24.10.15 uploaded Fee Confirmation List for the post of PGT under Advt. No. 4/2015 & 5/2015. HSSC requested all such candidate of PGT Advt. No. 4/2015 & 5/2015 who has deposited the fee in the designated bank and his/her name is not in the list to mail the fee deposit proof (i.e. fee challan) on hssc.fee@gmail.com on or before 06/11/2015 & 02/11/2015 upto 5 pm respectively. The Last date for Online Application for HSSC Recruitment 2015 to the post of TGT, TGT English & PGT has been extended upto 12.10.2015. Haryana Staff Selection Commission advertised 11099 posts of Trained Graduate Teacher (TGT), TGT Englsih & Post Graduate Teacher (PGT) in June/July 2015 through Advt. No. 03/2015, 04/2015, 05/2015 & 09/2015 respectively. Eligible and interested candidates can apply online for these teaching posts from 21.08.2015 to 21.09.2015 (extended upto 12.10.2015) through official website of HSSC i.e. www.hssc.gov.in. Here is the details. Matric with Hindi/Sanskrit or 10+2/B.A./M.A. with Hindi as one of the subject. Note - The candidates those who are having/passed HTET till the date of interview after advertisement will be allowed for interview on the basis of acquiring HTET (Test) till the date of interview. HSSC released a corrigendum on 06.10.2015 in reference to qualify HTET & B.Ed. for the post of PGT Computer Science, PGT Fine Arts & PGT Music of Advt. No. 5/2015. Candidates of these three posts can also apply online upto 12.10.2015. Candidates of M.A. Public Administration can also apply for the post of PGT Political Scinece of Advt. No. 4/2015. HSSC released a corrigendum on 01.10.2015 in reference to Essential Qualification for the post of PGT Political Science of Advt. No. 4/2015. HSSC amended the essential qualification for the post of PGT Pol. Science. Now candidates of M.A. Public Administration are also considered eligible for the post of PGT Pol. Science. Candidates having M.A. Public Aministration can also apply online for the post of PGT Pol. Science upto 12.10.2015. In pursuance of orders dated 27/7/2015 of the Hon'ble Punjab and Haryana High Court passed in CWPs No. 2441, 6076, 13150 of 2014 and 9132 of 2015 and Notification issued by the Chief Secretary Govt. of Haryana vide No. 22/149/2015 1GS-III dated 21/8/2015, HSSC informed to the candidates of SBC Category that the candidates who had applied against Advertisement No. 3/2015,4/2015, 5/2015 & 9/2015 under Special Backward Classes Category for various posts their candidature will be provisional subject to the final outcome of the aforesaid pending writ Petitions in the Hon'ble Punjab and Haryana High Court and further subject to the following conditions. 1. The candidates except those who have availed the benefit of age relaxation shall be considered against general vacancies. If successful in the examination and within the merit of general candidates. 2. In case the aforesaid writs are not decided till the recruitment process is over and result of the Special Backward Classed candidates who have availed the benefit of age and fee relaxation and have competed in general category on merit shall be withheld till the decision of the aforesaid Writs. In case the Special Backward Class reservation Notification is quashed then these SBC candidates result will be null and void as the become in eligible on ground of age. 3. In case of those SBC candidates who competed without benefit of age relaxation, against general vacancies and succeeded on merit, their result will be declared. Other terms and conditions of the advertisement will remain same. 18‐42 years, relaxation as given in special instructions. For working teachers upper age relaxation as per norms. Bank of India, State Bank of Patiala, Punjab National Bank and IDBI Bank etc. available on payment site, after 48 hours of registration of online application form. For other details regarding syllabus, admit card, exam pattern & category-wise post details click the above links or visit official website of Haryana SSC i.e. www.hssc.gov.in. Share your score in PGT Pol Sc HSSC Exam so that idea can be made about expected cut-off. I have 67 answers right in Rest of Haryana & 68 in Mwt cadre. Pol Sc. screening exam (HSSC) me highest score kya h?? ?